2. Any event that involves civilians requires the organiser to engage early with the Army BA Sec to allow liaison with civilian counterparts to ensure the event is licensed and all the civilian boxers and officials are insured. 3. Boxing Officers are to be read carefully the paragraph extracted from JSP 660 Sport in the UK Armed Forces when organising boxing events where charitable money is to be raised. 4. There are 11 Regional Association in England, and each control and license boxing events in their geographical area. The UK Armed Forces Boxing Association is an association in its own right. Any boxing that takes place in England must be licensed and this responsibility lies with the Regional Association Secretary, the only exception to this is for Service Boxing as long as it takes place with service personnel only and takes place on service property. 5. Permits or Licenses are granted to boxing events by the secretary whose region the event is due to take place in. They usually cost approximately £200. 6. Tournament permits are granted to ensure that matches and events are run within the rules of England boxing and are presided over by qualified officials. A permit acts as insurance for the boxers in the case of serious injury during a bout. 7. White collar boxing is unlicensed and uninsured, and is not permissible by any registered boxer. 8. Hotels, Leisure Centres and function halls must be licensed to stage boxing events. Organisers should ensure that the venue has a license to stage a boxing event. 9. The organisers of any shows that involve civilians in any way stated in Para 1 or Annex B to Section 8 must contact the Army BA Sec at the outset of any planning to discuss the event and the licensing of it. 10. Supervisors. The Supervisor is the senior official and is responsible for the safe conduct of the boxing on the event. a. A civilian supervisor must preside over a boxing event in a civilian location even if it is two military teams unless a military official known to the Regional Association Sec is agreed upon. b. A civilian supervisor may not preside over a boxing event in a military location even if the boxing taking place is between two civilian clubs. 12. Officials and Coaches. Officials and Coaches must be appropriately registered to take part in a civilian boxing event, this requires a registration through England Boxing (£22) and coaches will require a Disclosure and Barring Service certificate. Details of this can be found in Section 7. This is often time-consuming so early engagement is important. 13. Boxers. All boxers must be registered through England Boxing this is no more difficult than a Service Only boxing registration. Cost of this registration is £11 per boxer. 14. Application for authority to box in a civilian competition. Each boxer must apply to their CO for authority to box outside of a military environment, this is to place the boxer and coaches ON DUTY where appropriate and to allow the Army BA to be aware that one of its boxers is competing, should an injury occur. A copy must be sent to the Army BA Sec and a copy of the Tournament Record Sheet must be sent to the Army BA after the bout. A copy of the application can be found at Annex C to Section 8. 15. For boxing events that involve civilians and service personnel, all of the processes above must be followed, plus the Army BA Sec must liaise with both the countries boxing executives to gain permission for boxers registered to England Boxing to box foreign nationals, this applies to Northern Ireland. Only countries affiliated to AIBA may be competed against. See annex B/2 to Section 8. 16. Military boxing events in civilian venues in the rest of UK can create issues for the organiser in gaining a license, as all soldiers are registered as England Boxers, regardless of their country birth or country of residence. 17. 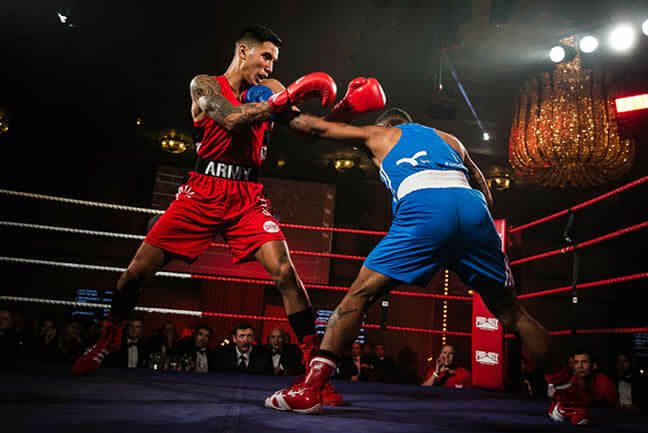 Technically the ARMY BA cannot license events outside of England, however events involving military personnel only in a venue holding a license to host boxing events will be granted a Certificate of Assurance as long as all the appropriate measures are in place. 18. The National Boxing Federation or Association will be informed but no local officials can be used to support such events as they are not insured. 20. The Army BA Sec will be required to apply to England Boxing for permission to take an English registered team abroad to box, only countries affiliated to AIBA may be visited. 21. England Boxing will liaise with the National Governing Body of the country to be visited to ask whether the boxers due to be matched are appropriately registered with genuine records of experience. See Annexes B and C1 to Section 8.